The Khmer Rouge claimed that they were creating ‘Year Zero’ through their extreme reconstruction methods. They believed that Cambodia (which was called Kampuchea from 1975-79) should be returned to an alleged ‘golden age’ when the land was cultivated by peasants and the country would be ruled for and by the poorest amongst society. They wanted all members of society to be rural agricultural workers rather than educated city dwellers, who the Khmer Rouge believed had been corrupted by western capitalist ideas. In order to enforce loyalty to the state, the Khmer Rouge broke peoples’ ties to religion and family. All political and civil rights were abolished. Formal education ceased and from January 1977, all children from the age of eight were separated from their parents and placed in labour camps, which taught them that the state was their ‘true’ parents. For the Khmer Rouge, children were central to the revolution as they believed they could be easily moulded, conditioned and indoctrinated. They could be taught to obey orders, become soldiers and kill enemies. Children were taught to believe that anyone not conforming to the Khmer laws were corrupt enemies. Khmer Rouge ideology stated that the only acceptable lifestyle was that of poor agricultural workers. Factories, hospitals, schools and universities were shut down. Lawyers, doctors, teachers, engineers and qualified professionals in all fields were thought to be a threat to the new regime. Religion of all kinds was banned as were music and radios. Money was abolished and all aspects of life were subject to regulation. People were not allowed to choose their own marriage partners. They could not leave their given place of work or even select the clothes that they would wear. 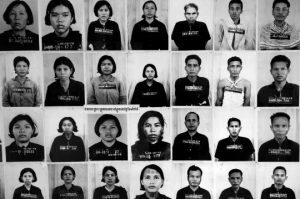 By instigating ‘Year Zero’ Pol Pot wished to create a state focused on their rural idyll, with all citizens pledging loyalty in a way which prohibited all personal, community or religious allegiances.